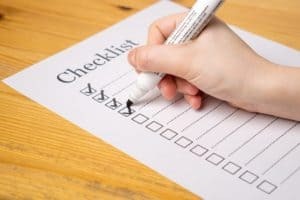 How to create a mortgage refinance checklist? Refinancing your mortgage can be a rewarding financial decision, but in order to reap the benefits, homeowners need to do a bit of leg work. From researching current refinance rates and industry trends to wrapping up closing, homeowners may need help keeping track of the process. A home refinancing checklist is a great solution for organization. It will give you a guideline for making the best deal on your new mortgage. Here is one example of items to include on a mortgage loan document checklist to ensure you are completing the process effectively. 1. What are your refinancing goals? This is the most important question to ask yourself if you are considering a refinance. The answer will help influence the decisions you make for the remainder of the process. Are you trying to lower your monthly payments? Is your home in need of repairs? Has your credit score improved since you took out your purchase mortgage? Answer this question to check the first box of your checklist. 2. Determine what the current refinance rates are. Before moving further into the refinancing process, determining if the timing is right from a market perspective. Use a refinancing calculator to see how your current loan terms measure up to the current refinance rates.Through basic web research, you should get a basic understanding of what the average interest rates available are. The U.S. Federal Reserve has gradually lifted interest rates over the last couple of years. The interest rates affect adjustable-rate mortgages and home equity lines most directly, but also have an impact on fixed-rate mortgages. The lift is anticipated to continue for the foreseeable future. If your interest rate is higher than the current predictions, it is important to move sooner rather than later. The deal you can secure today might not be as meaningful as the deal you can secure in the coming months or years. The idea of refinancing to save cash on your monthly payments is great, but can you afford to refinance? There are closing costs, appraisal costs, and other ancillary fees associated with refinancing. You will need upfront cash, in most cases, to cover these expenses. Also, if you plan to move soon or if you are nearing the end of your loan’s life, you’ll need to calculate the break-even point to ensure you’ll actually reap the benefits of a lower monthly payment. To calculate the break-even point, you need to divide the total amount you spent for closing by the amount you will save each month by refinancing. The sum of the equation will tell you the number of months it will take you to pay off the costs associated with refinancing. 4. You should determine which refinance option fits your needs. While most mortgage loan documents you need to collect will remain largely the same regardless of the lender or the product you secure, some options might help you skip a few steps, and other might add steps. If you refinance through your current lender, for instance, you may be eligible for a streamlined refinance which could help eliminate the need for an appraisal among other refinance needs. If you secure a VA loan, you might also be required to show Form DD214 and your Certificate of Eligibility, which isn’t required with a conventional fixed rate or adjustable rate mortgage. The most basic information you need to collect is an identification card with a picture of yourself that is current and your social security card. 6. Gather your creditor information. This will include a statement of debts and a statement of assets. In layman’s terms, you need to disclose the names of all the companies you owe, the account numbers, the amount you owe, and your payment schedules. It’s also usually required to provide information about your living arrangements for the past two years – including the name of your mortgage holder, the amount you pay per month, and any other important information. Proving that you are employed, and have a steady stream of income is important to lenders. You’ll need to disclose your employer’s names, addresses, phone numbers, and any other pertinent information. To prove consistent work, you’ll be required to present pay stubs and W2 forms for all your jobs – and for your spouse if applicable – for the last two years. Most times you’ll need to show your bank information – account numbers for any savings and or checking accounts or any other income you might have in the bank. You need to also provide the balances of these accounts. In many cases, the next form of documentation you need to secure is your home appraisal. It’s likely that your lender will arrange the appraisal for you so they can get a clear estimate the value of your home. The estimate is created using information about the condition of the home and the values of comparable properties nearby as a way to determine the risk of lending to you. The appraised value of the home should be greater than the loan amount. Now that you have collected all of the paperwork and gone through the appraisal process, your lender will start the approval and closing. An underwriter will give the final approval for a lender to provide you a loan. A closing agent might step in to review the completeness of your paperwork profile, and a lender will push the deal into escrow to ensure you have the essential insurance and tax documentation in line. Each of these items come with a fee. It should be clear, up front, how much to expect from this stage of the refinance process. All these documents are necessary for refinancing your mortgage. Once this list has been completed, you are done with the refinance process. Make sure you make and follow your home refinance checklist for a better and easier deal. Previous post: How do current mortgage refinance rate trends look?